I was lucky to enjoy a seven-year friendship and collaboration with Hans Heckmann. With the guidance and support of Metascience founder George Meek, Hans and I got immersed in the miraculous ITC research underway in Europe in the 1990s. All three of us received phone calls from the late Konstantin Raudive, the famous EVP pioneer who had died in 1974… and we were present on various occasions when Raudive and his spirit friends of Timestream delivered messages and images through radios, TVs, computers, and other equipment of European researchers, especially Maggy Fischbach of Luxembourg. Hans died quietly a couple of days ago (Friday, 2013 February 15), a month before his 89th birthday. Hans had been a German soldier during World War II, when he met and fell in love with an American nurse stationed in Europe. After the war they got married and settled in Pennsylvania. Hans would play a crucial role in world ITC in the coming years, doing much of the engineering on George’s spirit communication systems developed throughout the 1980s. In the 1990s, the most spectacular reports of researchers in Europe were being published in German, and Hans would soon begin translating them with tremendous care and clarity into English, and in so doing would be instrumental in the spread of ITC knowledge to the Americas. In 1992 George arranged a research trip for Hans and me. We flew to Europe to meet most of the main ITC researchers at a conference in Dusseldorf… and afterward drove through Germany and Luxembourg to visit researchers in their homes and labs. STATION FEEDBACK. GROUP OF SCIENTISTS. THIS IS HENRI SAINTE CLAIRE DEVILLE. UNFORTUNATELY, IT WAS NOT POSSIBLE TO JOIN COMMON EFFORTS OF (spirit groups) TIMESTREAM AND CENTRAL TO MAKE SUCCESSFUL CONTACT ON SATURDAY. PLEASE DO NOT CHANGE THIS ADDRESS. IT IS MERELY A PROBLEM OF ENERGY AND FREQUENCY. YOU WILL HAVE TO CHANGE A SMALL PART OF YOUR DEVICE. WE WILL KEEP YOU INFORMED OF THE APPARATUS NEEDED. MY SPECIAL GREETINGS TO HANS HECKMANN AND MARK MACY. I LEFT PROJECT LIFELINE A FEW YEARS AGO AND AM NOW A MEMBER OF THIS NEW GROUP OF SCIENTISTS. WE ARE WORKING UNDER THE DIRECTION OF MARIE CURIE. GIVE OUR GREETINGS TO GEORGE (Meek). MAY 3, 1992. Hans and I also visited with experimenter Friedrich Malkhoff at his home in Schweich, Germany… who shared with us the results of various German ITC researchers, including Adolf Homes and Hans-Otto Koenig. 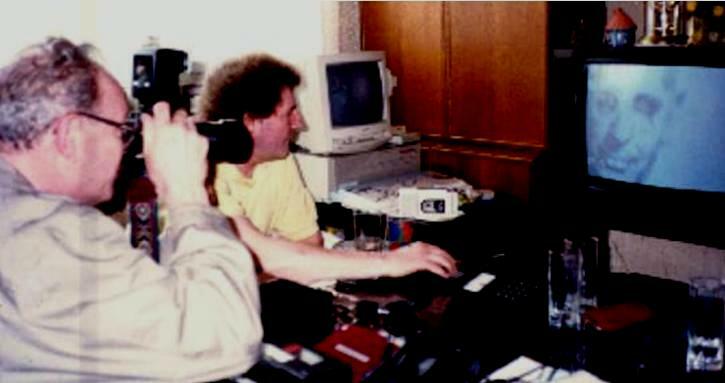 I took this picture of Hans (left) taking a picture of a TV transcontact during our trip to Europe. It’s an image of Doc Mueller (the spirit who had spoken through the Spiricom device of George Meek and Bill O’Neil, circa 1980, but who now was resonant with German researcher Adolf Homes, who had captured this image on his TV set). Homes’ colleague Fritz Malkhoff is in the yellow shirt, sharing the picture with us at his home in Schweich. Read Hans’s trip report here, starting on p18. A couple of years later I was again visiting the Luxembourg researchers when Konstantin Raudive delivered a long message through the radio sounds, in which the Timestream spirit group acknowledged Hans for his good work in ITC. Finally, last but not least, Mark Macy. My dear friend, we bring our greetings to Colleague Meek and the Uphoffs. Also to Hans Heckmann with whom he realizes a beautiful job to spread ITC information. You know by experience, Mark, how dangerous drugs of all kinds can be. Try to warn humanity that they not only alter their present lives on your side, but also influence in a negative way their future lives. Go on with your experiences and you will see that the bridge to the States will soon be strengthened. Regina as your twin soul can help you a lot. Listen to her inner voice and you will be in the right way. Hans’s background (adapted from a Carlson Center bio given to me by his granddaughter Tanya Dapkey). 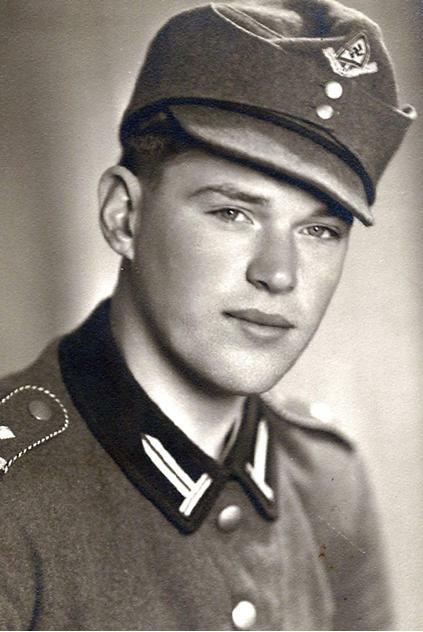 Hans Josef Heckmann was born an only child in Heidelberg, Germany, on March 26, 1924. He enjoyed swimming in the Neckar River, hiking in the Black Forest, and dropping by the grocery store owned by his grandparents, who always gave him a treat. At age 14 he joined the compulsory Hitler Youth Movement, and was later drafted into the German army during World War II. He was seriously wounded and captured at the Russian front, and spent two years in a prison camp. After the war, the US government hired Hans as a teletype operator in Heidelberg, where he met his wife, Rita, a US Army nurse. Hans was studying English, Rita was learning German, and their language teacher arranged for them to meet. They married in Heidelberg in September, 1950, and honeymooned in Austria. They settled in Philadelphia, had four daughters, and moved to East Lansdowne in 1959. Hans became a naturalized US citizen and took a job as a professional studio photographer. Then he worked until retirement as a teletype operator on the Pennsylvania Railroad, which later became Conrail. His pastimes included photography, electronics, and listening to classical music. In his later years, he was drawn to spiritual research and translated German documents into English for various afterlife projects. It was during those later years when his path crossed with mine, and we became immersed together in ITC research… which is slowly changing the world in a most wonderful way… as indicated by the rich archives of ITC Gems published on this site… most of which were translated carefully from German by my trusted friend and dedicated colleague Hans Heckmann. This entry was posted in About Mark Macy, After we die, what then?, ITC Gems and tagged Hans Heckmann, ITC research. Bookmark the permalink. This Macy Afterlife Beacon writing had a number of extremely helpful and interesting historical ITC facts, as well as the very helpful ITC Gems link. I have alot of empathy and feeling about the story of Hans, having to come through the Hitler youth movement and then be wounded by the Russians, and surviving that to go on to become involved with greater endeavors. And he just crossed over a few days ago. It is a good posting for us to know these things. I read ITC Gem #1 by Technician, and it sort of got my attention, to say the least. I am very grateful to see this insight in the written word; an insight which has been swimming inside of me in a latent fashion. Now, I have a bit more clarity. And just today I was writing a draft which mentions quantum entanglement! What do we know of reality? How does one apologize to the Beings on spirit side for all of the alternate realities we must be burdening them with? This is a serious question. I am going to attempt to become more humble and quiet and grateful for what I have and who I am. So, speaking of changing realities, your writings are changing mine, and it is very refreshing. I too fully agree with John R.M. Day (previous comment) I have been reading transcripts from Salumet & friends who is an enlightend entity bearing very similiar teachings to technician and the seven. In Konstantin Raudive’s communication he mentioned “twin souls” in relation to Regina. Salumet also gives an explaination on twin souls, just goes to show that many masters are gathered to help humankind at this present time. And thank you John R.M., dear friend, for also (like Alison) pulling it altogether into a clearer perspective. Here’s a link to an article that helps explain why the contacts ended for the time being. Glad you resonate with my work! Thank you, this article very much answered my question. I am not sure where this life long journey of searching for answers is to lead me, or what it is though invisible to me seems pretty persistent in directing me to this unknown destination for the answer or answers. Whatever it is it led me to the scole experiment, then to you, from you to Chico Xavier and from him to Allan Kardec. Who knows where Im led to next. I thank you for your wisdom on this wonderful journey and for your writings that seem to be part of my souls ascension. In parting I do have another question for you and thank you for your response as Im sure you are busy. What is your take on Allan Kardecs writings? Does it resonate in you and do you feel that Xaviers experience as well as yours and Kardecs are all linked to the same spiritual afterlife? In short do they all seem to relate? Thank you. There’s truth in all of those sources (Scole group, Xavier, Kardec), but as our spirit friends tell us, any afterlife descriptions we have from the earth side are incomplete and maybe not entirely accurate……. John, your struggle between hormones, career, material desires on one hand… and seeking that finer spiritual truth within… the struggle between maya and the greater reality… is the same struggle we all share while alive here on Earth. God bless you for your persistence. It’s what we’re all really here for… the noble quest. I hope you find the ecstasy and inner peace that’s at the end of the rainbow, so to speak. you and I took when the INIT conference was held in Trier. Since we last met my video taping interviews has focused on the SETH material and the research of renowned physicist Ron Bryan Professor Emeritus at Texas A&M. to a portal between our dimension and other dimensions. I highly recommend McMoneagle’s book Mind Trek. he will test to see if the smallest particles in our universe have consciousness. Joe McMoneagle married into the family of Robert Monroe founder of the Monroe Institute in Virginia and author of Journeys out of the Body. My work has also taken me to the Psychotonics Association where I had a chance to meet some incredible researchers including Bob Beutilich, Dr Norm Shealy, Tom Valone and Barbara Hero. Mass General Hospital trained neuro surgeon Norm Shealy has been working with the spirit world since 1970. I also interviewed his business partner Caroline Myss. Let me recommend the work of a distant neighbor of mine in Maine, Professor Kyriacos Markides who has been studying the miracles at Mount Athos in Greece. I recommend his book Riding with the Lion and Mountain of Silence. Please take some time and visit the work at the Farsight Institute and their groundbreaking work on multiple time streams. I hope you and your your wife Joanna are doing well. Hey Joe, good luck with all that filming. I am Hans’ daughter Rita (Tanya is my daughter) and I wanted to share something with you. I recently had the opportunity to speak through a very gifted medium to my Dad and I wanted to let you know that he is doing very well. He told us he is very busy and really thrilled to be on the other side. I asked him if it was like he thought it would be, and his answer was “better”. He is so happy. He felt the affects of his life on others from their perspective after he crossed. My Mom also told us that she was amazed and that she sees things differently than she did while here. Thought I would let you know. Take care and keep up the good work. I don’t recall ever getting an earlier post from you, so I’m glad you tried again… and delighted to hear that your dad and mom have gotten settled in nicely on the other side. Hans is among the brightest, kindest, gentlest men I’ve had the pleasure to know in this lifetime. No surprise he’s in a paradise better than he’d imagined. Our spirit friends told us they were planning a special celebration for him when he “came home” after his years on Earth. Hans also made me aware of the difficulties your mom, Rita (Sr.*), had trying to reconcile her Catholic faith with Hans’s ITC research. My sense is that between her basic goodness and Hans’s gentle patience, the two of them kept things on an even keel in their relationship and your family. Please convey my warm wishes to Tanya, who’s been in touch with me on several occasions since her grandpa’s passing. * My wife Regina also inherited her name from her mom, Regina (Sr), whom we called “Reggie” while she was living with us up until her death some years ago.